Today’s bespoke wedding from Dawn Heumann Photography is not only a feast for the eye, but a beautiful example of a clear vision and talented (not to mention generous) friends can do for your wedding. 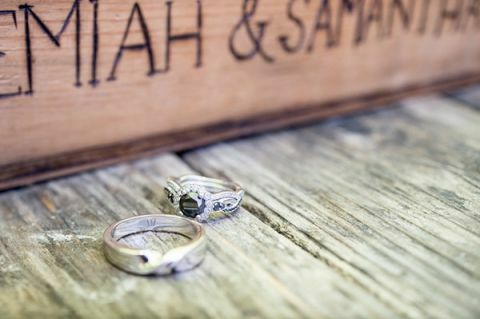 Jeremiah and Samantha tied the knot in an intimate and almost entirely handmade wedding at Orr Hot Springs Resort, in a wonderful three-day local destination affair! Many of their friends and family came together to create the beautiful and entirely custom details for their wedding day, and their thanks was a wedding that doubled as a mini-vacation for everyone who attended, surrounded by beautiful decor and wonderfully scored by – what else – friend’s bands. Guests stayed onsite in the lodging at the resort, which boasted comfortable camp-style lodging as well as the eponymous hot springs to relax in before the festivities began. 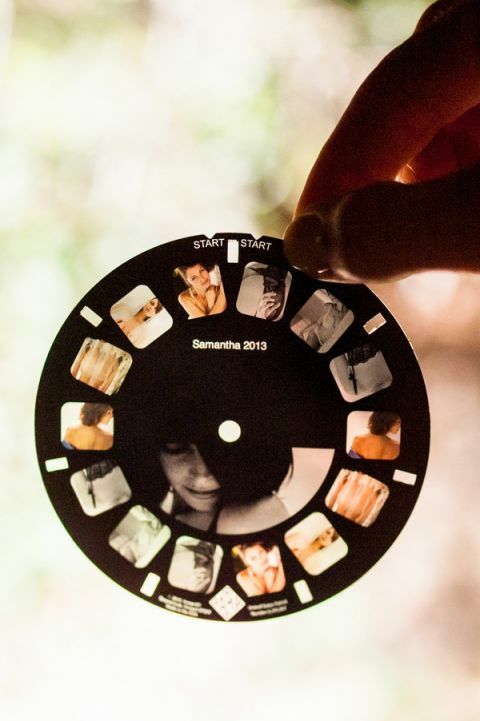 Their personal details started from the very first glimpse guests received of their wedding – the invitations. 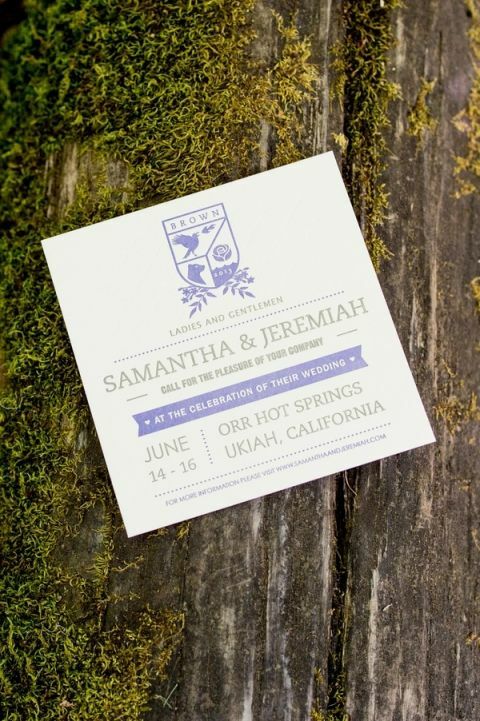 Samantha worked with a designer friend to custom create their invitation suite. Jeremiah had a heavy hand in the finished product, which doubled as a work of art featuring a custom designed crest for their new family. It set the tone for their wonderfully unique wedding, and directed guests to their wedding website for more information. 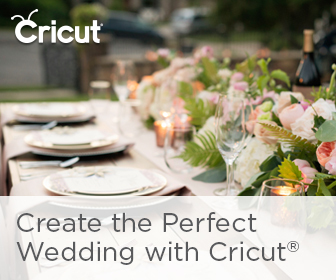 The rest of their details were just as personal – from Samantha’s custom designed gown by Julie Ireland Dressmaking, a personalized Viewfinder reel of the bride, and decor handmade by friends! 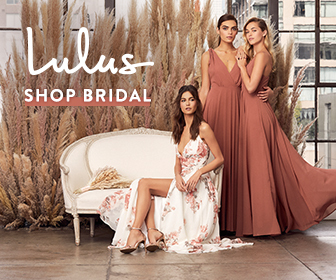 A close friend designed and sourced all of their florals – from the ceremony arch and boutonnieres to the bride’s bouquet wrapped in hand selected lace from her wedding dress. Friends gathered for pre-wedding festivities put together all of the table arrangements according to Samantha’s brief – and were hopefully rewarded with a glass of the winemaker friend’s bubbly and a dip in the hot springs! Even the cake and dessert display was handmade by a friend and honored guest and reflected the community minded spirit of their day.